The magnitude of the 1906 San Francisco earthquake has been estimated at 7.9 (Moment Magnitude Scale). The 1906 San Francisco earthquake was the first natural disaster of its magnitude documented by photography and motion pictures. For tracking earthquakes around the world in near real-time, follow GrokEarth's @SeismicPing feed on Twitter. To track earthquakes within a 300 mile radius of San Francisco, follow GrokEarth' @SeismicPingSF feed on Twitter. Largest Earthquakes in the World Since 1900, USGS, updated yearly. 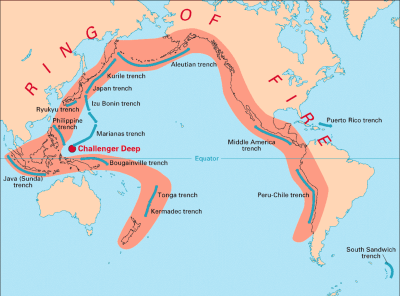 Earthquake Magnitude, GrokEarth, May 19, 2012. Ring of Fire, GrokEarth, August 11, 2012.